Welcome to the site. Here you can find information, news and updates about GAVIN MARWICK and the various musical projects he’s involved in; a gig diary for shows and events; some of the tunes he’s written; information about recordings; a shop for music and CDs - there’ll be something here to catch your attention or answer a query. For more information/bookings etc please get in touch, and we’ll see you somewhere there’s a tune happening. Gavin Marwick's Journeyman Spectacular was on the shortlist for Live Act of the Year in the Scots Trad Music Awards 2014, and Gavin was on the shortlist as Composer of the Year. JOURNEYMAN will be performing some live dates in 2018, news coming soon. For upcoming live dates watch this space! Gavin's double album 'THE LONG ROAD AND THE FAR HORIZONS' is available here. Launched at Celtic Connections to a sold out crowd and a standing ovation, it contains over 2 hours of original tunes with a 13 piece band! 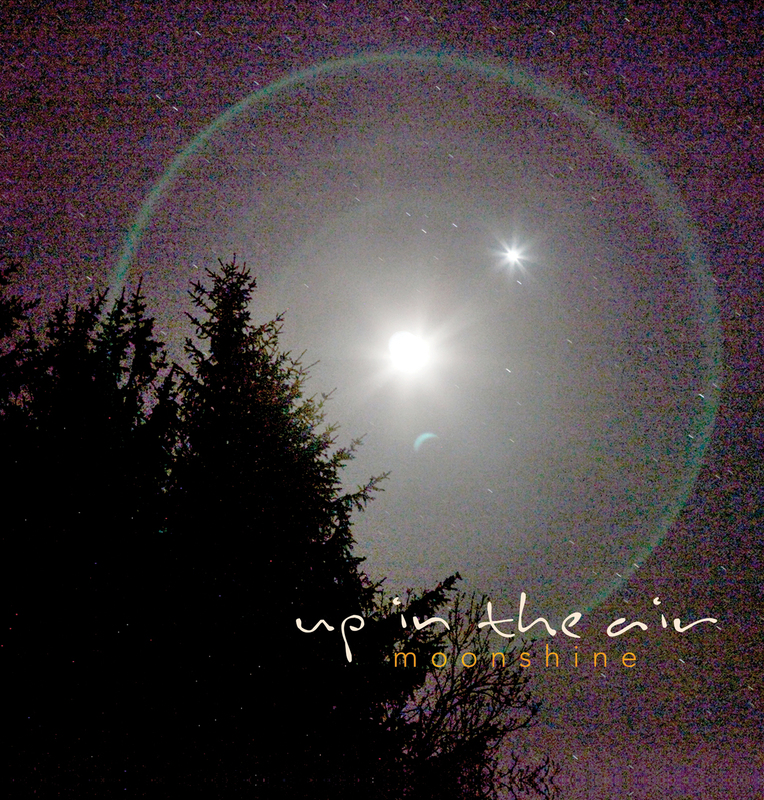 “MOONSHINE” (Up In The Air) JYM003: Jonny Hardie, Gavin Marwick and Davy Cattanach’s first recording together since their much loved original Up In The Air album. The 10 piece band (described as a "folk festival on stage") is led by fiddler Gavin Marwick (Ceilidh Minogue/Iron Horse/Unusual Suspects) and features music he has written interspersed with songs and other contributions from the multi-talented array of performers on stage. This includes sets from Bellevue Rendezvous, Old Blind Dogs Allstars, Up In The Air and Aaron Jones and Claire Mann. 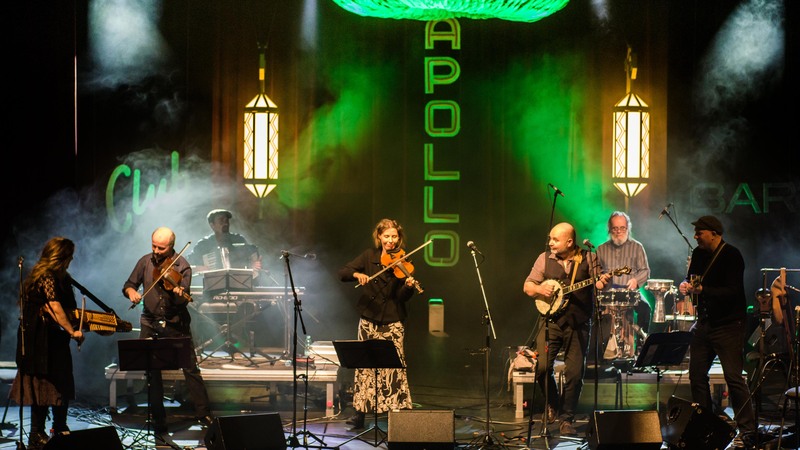 The concerts tend to mix short sets from each band within a constantly changing musical line-up, ranging from intimate duos and trios to the massive sound allowed by the Journeyman show with all 10 musicians, spectacular both by name and by nature. Thanks to a grant from Creative Scotland, Marwick, a prolific composer, earlier this year released through his Journeyman label, both a double album ‘The Long Road and The Far Horizons’ (which features all the musicians involved in the live show as well as a few more) and ‘Horizons’, a tune book containing some 200 of his compositions. The music reflects both his Scottish roots and the influences and inspirations of a lifetime as a professional musician. 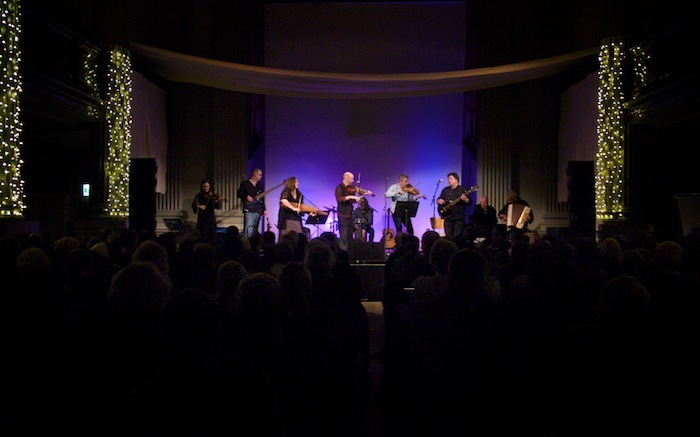 The CD was launched at Celtic Connections with the debut of the Journeyman Spectacular, ten of the thirteen musicians who played on the album, to a sold out audience and a standing ovation. Subsequently the band has played other concerts round Scotland including being booked to do a whole night at Stonehaven Folk Festival. Gavin has 30 years experience working with an enormous number of musicians, concert bands, ceilidh bands, orchestras, theatre and TV companies in many different settings across vast swathes of the globe. Years in rehearsal rooms and recording studios have given him an ear for arrangement and instrumentation. He is an innovative composer, crossing Scottish traditional-style with other influences, and experimenting with forms and modes. Gavin has been composing for many years, and has a collection of 40 manuscript books containing approximately 3000 self-penned tunes. This project is to start making these tunes publicly available, with an initial tune book, a CD of highlights from the book and publicity for the whole project. His tunes have been acclaimed by critics, requested by students, applauded by concert goers, danced to, played in sessions and on stages by other musicians and bands (in addition to his own) and in several cases recorded by them (including Old Blind Dogs, Marie Fielding, Unusual Suspects, Arz Nevez, Dochas). There are dance tunes, descriptive pieces; historic and contemporary influences; genre-specific and broad geographic influences; delight and sadness; moments of peculiar strangeness; airs, jigs, reels, marches, waltzes, strathspeys, elegies and pastorals; tunes in the style of polskas, horas, munieras, lang dances and mazurkas; tunes inspired by land, sea, weather, people, places or some small fancy; tunes inspired by and written for fiddle, pipes, harp, accordion, bouzouki, guitar, piano, nyckelharpa, whistle, the human voice; bespoke pieces for theatre, commissions and specific ensembles; finally a fair amount that are beyond pigeonholing and represent the development of a dedicated, hardworking and unique artist. With Gavin Marwick, there’s a sense of a man on a mission and as I type, this weekend will see the first of a series of concert spectaculars featuring at least 10 of the 13 musicians who play on the new CD. Naturally enough, Celtic Connections is the perfect launching pad for such ambition, but the story behind it and the accompanying The Long Road And The Far Horizons, brings a new focus to an extraordinary career and ties together the multiple strands of music that course through Gavin’s veins. His name may already be familiar to some of you, perhaps the regular festival attendees, ceilidh devotees and just the lovers of great music, but almost certainly amongst the fiddle players out there. He’s a master of his chosen instrument and much in demand as an active contributor to the likes of Burach, Iron Horse, Cantrip, Up In The Air and Bellevue Rendezvous, or The Unusual Suspects, Ceilidh Minogue, Old Blind Dogs and even Session A9 and Malinky. You start to get the picture of bands too numerous to list in full and that’s before we get to the teaching, theatre, film and TV work. He’s naturally a prolific composer too, having a number of manuscript books containing some 3,000 tunes, give or take, which is ultimately the driving force behind The Long Road And The Far Horizons, a release that marks the start of what is being billed the Journeyman Collection. There’s a nice line from Gavin himself in the CD notes. He’s thanking Creative Scotland for their backing but also his partner Ruth Morris and the other musicians involved and says, “I’ve been writing tunes since 1988, composing for bands, theatre, shows and for fun. The more I wrote, the more I had a pipe dream of making albums of self penned material and recording them with musician friends I’ve made over the years.” The Long Road And The Far Horizons is the start of realising that dream and with the accompanying tune book, also the start of making the fruits of Gavin’s astonishing creativity available in the public domain. Given all of this it won’t surprise you to learn that Gavin grew up in a musical environment, but he was also tutored by some of the greats of Scottish fiddle playing including Tom Anderson, Angus Grant, Davy Tulloch and Alastair Hardie. The latter was a founder of The Hardie Press and someone else who realised ambitions to develop resources to promote Scottish music, albeit with a more historical rather than compositional slant. Gavin also had lessons form Michael Rigg, who is part of RSNO, introducing some classical elements and disciplines. But his tuition didn’t end there and through touring internationally, Gavin has continued to pick up the music of other countries and cultures and absorb it into his own. That last element probably finds it’s most obvious expression through Gavin’s involvement in the Yiddish Song Project, but also through Bellevue Rendezvous. That name is of course an affectionate reference to the Sylvain Chomet Film and Gavin’s native Edinburgh in one hit, although the trio of Gavin, partner Ruth on nychelharpa and Cameron Robson on cittern cast their net wider than the film’s French setting, sweeping up influences from Serbia, Macedonia, Poland, Canada, France and Finland to create the quirky, good humoured world fusion. Their second CD release Salamander (read the FRUK review here), another more obscure Edinburgh reference, was particularly well received and critically acclaimed. Something else, given the above that shouldn’t come as much of a surprise, is that The Long Road And The Far Horizons is a double disc set. Gavin after all has a wealth of material to call upon, but it is a brave decision and bold statement of intent none the less. There is an awful lot to get your head around here and some of the material surrounding the release suggest a litany of different musical style from airs, jigs, reels and marches, through waltzes and the more exotic polskas, munieras, horas, mazurkas and lång dances. Whilst of infinite fascination to musicologists and probably anyone with the musical chops to pick up on Gavin’s work and fiddle away for themselves, thankfully, however, this is not an exclusive club. In that respect Gavin’s sleeve notes are again helpful and he eschews a simple classification by style or chronology, grouping the tunes instead by the source of their inspiration, or in some cases according to the commission at their point of origin. Whilst there is plenty to serve the intellect, this is very much about feel and the playing form the 13 strong musical cast is sublime and sparky by turn. The different styles serve to ring the changes and keep things moving along, changing the emotional focus and making the Journeyman Collection title seem entirely apposite. With both CDs clocking over an hour of music this set may be on the long side for a single sitting, although patience as always will have its own special rewards. That title, however, could be written as The Long Road and The Far Horizons, as each of the CDs is separately labelled. Although it may be hard to pinpoint any specific difference between the two as they are entirely complementary, each disc also makes a satisfying listen in its own right. The Long Road then opens with Firedance Parts 1 & 2…let’s just say it’s jumped straight into the list of the most beautiful pieces of music to delight my ears… Ever! The Long Road then opens with Firedance Parts 1 & 2, originally composed for the score of a play by Nicola McCartney called Heritage. Straight away it has an unusual musical voice with Fraser Fifield’s sax in the mix. In searching for a way to describe this, let’s just say it’s jumped straight into the list of the most beautiful pieces of music to delight my ears… Ever! Roy Marchbank’s / Vodka by contrast is brisk and light headed, giddy with drink perhaps. Those unusual instrumental voices crop up here and there. The sax, the sudden focus of low whistle on Marsten / Longmuire, the surprising effective Jew’s harp on Samarkand / The Plate Smasher and some lovely and purposeful piano. But it’s the constantly changing mood that proves to be one of the disc’s highlights. It happens throughout the disc, track to track, but sometimes within the tune sets. It can be as simple as changing from minor to major key, a rhythmic shift, but more markedly between an eastern exoticism and more homely feel. The shifts between say, Dusk – almost like a chamber orchestra, elegiac and reflective, through The Minotaur / Scented Grove – tricky shifting rhythms, into The Pyranean Jig set – a memorable tune which breaks out into a musical cartoon-caper with a huge sense of fun, are simply breathtaking. Perhaps it’s appropriate The Far Horizons opens with a slightly weightier feel to it. Certainly through the first three tracks, which seem more outwardly orchestral, reflective, dramatic even and perhaps that’s the distinction. It’s almost like The Long Road has been our journey to the sea shore and we are now setting sail with the ocean’s expanse giving wide, featureless yet constantly shifting horizon. Even when the tempo quickens as it does on the Lowrey’s set or The Foot Of Ben Newe set, somehow the gravitas lingers. Perhaps rather than a journey in miles and leagues, its one of time and years, with The Far Horizon’s heading towards the end of life’s passage. The presence of the track Pallbearers at the end of the disc may support that notion, but you will doubtless form your own interpretation. This is after all music that will make you think, dream a little and conjure images from deep within the subconscious. It’s music that will offer surprises in it’s constantly shifting moods, delight in its vivacity, but above all will make you feel. There is an abundance of joy, but also misty eyed melancholy to be found within. It is like an internal journey with a constantly emotional landscape. Let your mind wander its course, because when measured against the journey of The Long Road And The Far Horizons, two hours is but a sliver of time to give. After all, they do say that travel broadens the mind and herein lies the proof of that. The extremely talented fiddle player Gavin Marwick has finally launched his long awaited debut album, a double one at that too! This Celtic Connections 2014 concert titled Gavin Marwick’s Journeyman Spectacular also doubled as Gavin’s long awaited debut album launch. It was very aptly named as “Spectacular”, it most certainly was. 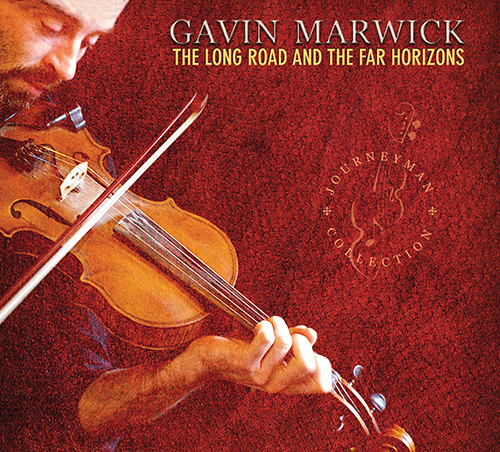 For many years Gavin Marwick has featured in many bands as an outstanding fiddle player but has now come to the fore with a double album, ‘The Long Road and the Far Horizons’ which is all music written by himself. The concert showcased this fantastic album and was like Ceilidh Minogue meets Bellevue Rendezvous with many extras. Gavin featured in both these bands and his fellow band members have joined him in this venture, as indeed do many other very talented musicians. The line up was like a who’s who in Scottish music. On seeing this line up I knew the concert was going to be a musical extravaganza and I was not disappointed. Right from the very start the audience were totally gripped by the superb musicianship on show in front of them. From reels, to jigs, to slow airs, to traditional songs the audience were thoroughly entertained. There were even some who could not resist the temptation and were dancing away down the sides of the auditorium. 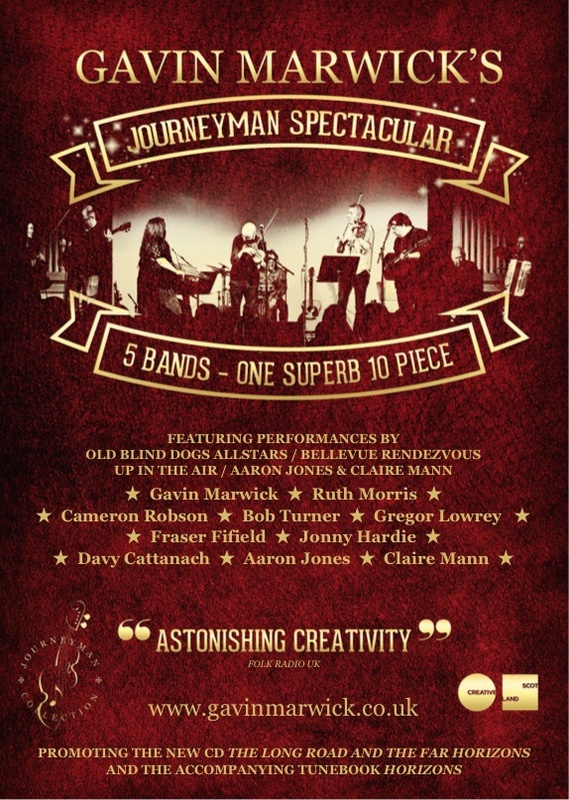 The Journeyman Spectacular will be going on tour and this is one concert I would definitely make a point of seeing when it comes to a venue near you. Gavin’s fiddling ability has never been in doubt and now that this album is all self penned material and the music is played by up to 10 different musicians at the same time you are guaranteed a phenomenal experience. 18th January 2014, Saturday night down in Glasgow’s old St Andrews Square a magical musical journey delighted a sold out Celtic Connections Festival audience. It was created by a band in full flight, orchestrated and conducted by a musician at the peak of his talent and power; Gavin Marwick, fiddler extraordinaire, composer and author. Together with his musician friends, members of the Old Blind Dogs, Ceilidh Minogue, Bellevue Rendezvous and Up in the Air, they delivered to an enchanted audience a jaw dropping treat of original reels, songs and jigs, sometimes gently played, at other times delivered with the skirl of a Highland storm. A sound that was full, perfect and honest. Here was music that soared in a torrent of ecstatic beauty in a no nonsense Scottish fashion. Music that took us to Old Europe where in a brief respite we could ponder the echoes of our musical past via the refrains of gypsy violins played under the stars beside the communal fire. Then we were whisked on a romantic flight of wailing sounds to wild rocky outcrops, barren windswept moors and moody glens and mountains of Scotland’s West Highlands before being transported home to a safe familiar cityscape of reflective childhood; the memory of sitting on the back steps of an Edinburgh tenement composing a new tune. Like a rainbow this performance was an odyssey in a spectrum of beautiful sounds descending on the audience’s ears like a mist. A tour of Scotland of the heart and mind guided by the safe and sensitive hands of Gavin Marwick and his merry band, celebrating the long awaited release of his solo album ‘The Long Road and The Far Horizons’. This is enlightened Scottish fiddle music, this is music highly recommended to both new comers and aficionados, and this is real music worth hearing and deserving of its place in the nation’s culture.